Flaunden have been established for well over 30 years. For a Sunday football team to still be in existence for that time is quite unusual. With the cost of running a team ever increasing the club is very reliant on its members and gaining sponsorship from local businesses. Over the years we have had numerous sponsors and currently we are supported by Boxmoor Social Club. Without this sponsorship we would not be able to carry on so my thanks goes to them. Flaunden have always participated in the Berkhamsted Sunday Football League, but not necessarily under the same team name, we have been called Classic Envelopes and Green Dragon Flaunden to name but two. After winning the Division One League Title in 2009/10 we are now a well established Premier Division Club. In recent seasons we have made it to several cup finals winning the Steve Norwood Challenge Cup three years in a row. 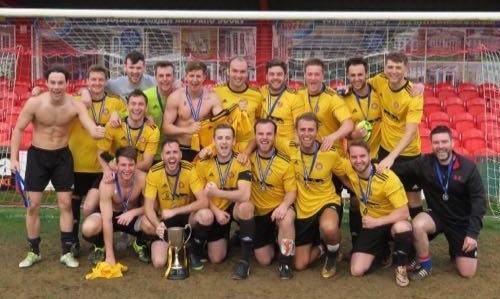 Last season was the most successful in the club’s history, we became Premier Division Champions for the first time and then completed a league and cup double by winning the League Senior Cup. It was nearly a historic treble but unfortunately we lost in the County Cup final to Skew Bridge 2-1 after extra time. This season we currently sit top of the Premier Division and have also entered the FA Sunday Cup for the first time which is a Country wide Cup Competition. In our first game we will play Old Southall at Bovingdon FC on the 11th November kick off at 1pm. All support would be very much welcomed and appreciated. If you are interested in playing/supporting or sponsoring the club then contact details are below, all home games (excluding Sunday Cup) are played up at the village hall.